Second thing we noticed: The photographer! Just to all you haters who say we’re too shy to put our own fashion on camera, we’ve got a blue tshirt here!! Thanks to Mary Knuth for spotting this duo. 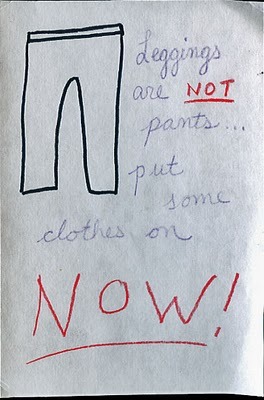 Also, in case you don’t read Postsecret, last week’s secrets included a nopants-related one! The bad news: Someone still considers “leggings are not pants” to be a SECRET. We hope not! Thanks to Kery and Sam for spotting this!